I've finally got successful modifications to add a bit more room to the back of the Skew ankle (at the top of the heel). A lot of people have said (and this is my experience) that their Skews are comfortable once on, but hard to wiggle into. That's because the band at the back of the heel is biased with respect to the main sock fabric. So here's what I did: On the 13th and 25th rounds after beginning the ankle gusset, I worked short rows 8 stitches long over the ankle band. (That's 4 stitches on either side of the second ankle marker for the left sock, but on either side of the first ankle marker for the right sock.) You can use any gap-closing method you like; I chose the Japanese method. This photo shows the heel of the left sock (toe is pointing upwards); can you find the short rows from the 13th round? I can, but they're pretty subtle in the handpainted yarn (Kitchen Sink Dyeworks Merino Fine, BTW). Do be careful to make a conscious choice about increasing on the knit-side short rows. I only increased on the first pass (before the first turn, but not right after both turns) to keep the stitch counts correct. If you increase both before turning and after both turns, you will add one stitch to the back of the leg and one stitch to the heel per pair of short rows. Oh, and I'll hide a little bit of exciting (to me, anyway) news at the end of this post: I've just received a test knitter's review of my next pattern! I expect to have it ready for publication no later than early April. It's been two weeks since Knitty.com released Skew as a mid-Winter Surprise, and I've been ecstatic about its generally-positive reception. I know that no sock construction can be ideal for every foot, but of course I want the Skew sockitecture so suit as many feet as possible, so I've been working madly on fit modifications. Here's what I've come up with so far. Higher instep: In the first row of the "Inner ankle" section, increase six times on the sole of the foot. Explicitly: for the left sock, when 25 stitches remain in the round, work (k1, RLinc, k1) 6 times, k 10, SSK, k1. I bet you can generalize for the right sock. :) Then, when you work the first round of the "Heel shaping: Left sock only" section, k 13 instead of k 10. The Kitchener-stitched section in the Origami Moment will have 18 stitches instead of 15. "Decrease mini-gusset" section, but omit the opposing decreases (SSK near end of round on the left leg; k2tog near beginning of round on the right leg) on alternate rounds. The result is 78 leg stitches instead of 72. You will need to work an extra set of short rows on the leg before the ribbing. Thinner legs/ankles: Try eliminating the increases on either side of the first ankle marker (for the left leg) during the "Inner Ankle" section on every fourth round, three times. The result is 66 leg stitches instead of 72. You will need to work one fewer set of short rows on the leg before the ribbing. Roomier heel back: Several knitters have expressed frustration at the snugness of the band at the upper back of the heel. I admit this requires a little wiggling to pull on, but for me, the fit once the sock is on is exceptional. For many feet, the high-instep mods described above will add sufficient wiggle room to pull on the socks. I've tried working additional rounds in the heel section, but the result was too much distortion in the leg (the outer leg vertical band ends up too far towards the back). I intend to try adding some short rows over the heel band, but haven't test-knitted it yet. Stay tuned. I do plan to release a multi-size version of Skew later, but for the brave, I'm posting my notes on how to shape the heel for an 84-stitch foot. A talented friend successfully produced socks from these notes. If you need line-by-line instructions, I'm afraid you'll have to be be patient until the official version comes out. KNIT AT YOUR OWN RISK. I have not personally tested these numbers and can't provide "pattern" support. Cast on 8 stitches per needle, increase in the big toe section to 56 stitches, then to 84 in the mid-toe section. Inner ankle gusset (IAG) needs to create 42 sts for the back of the leg, which takes 42 rounds (21 shaping rounds separated by plain knit rounds). After 7 IAG shaping rounds (14 sts between IAG markers), start working mini-gusset shaping as for the 72-stitch version. After 14 IAG shaping rounds (28 sts between IAG markers), start the heel decreases. 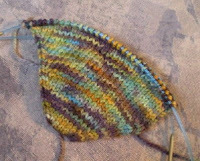 During the heel decreases, my notes say there should be 18 stitches between markers instead of the 15 for 72-st version-- so on left sock, replace "k 10" with "k 13." 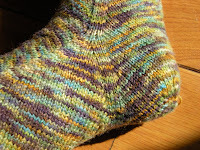 My Skew sock has been published! It is one of the winter Knitty surprises. The waiting has been killing me. I'm short on time today (I'm prepping for a crochet scarf class tonight), but I promise to blog tomorrow with some notes on upsizing (and downsizing). Also, there is an error in the Big Toe section; I've put an errata note on the Ravelry pattern page, and will add the details here too shortly.